Click on the specimen to view a larger image. 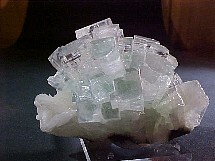 An awesome display of light green "cube like" crystals with I believe minor stilbite. The photo does no justice to this stunning piece 1-3/4" x 1-1/2" x 1". 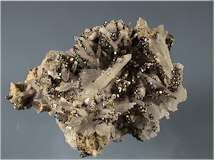 Barite: Meikle Mine, Elko County, Nevada. 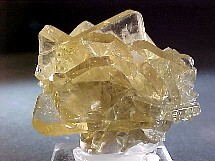 A wonderful cluster of golden barite crystals w/minor matrix. A small miniature: 1-1/4" across. Stibnite: Baia Sprie, BaiaMare, Romania. 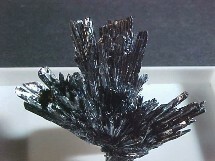 A lovely spray of "silvery" stibnite. A nice miniature. 1-1/4" across. 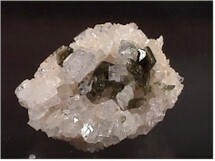 Brilliant small pyrite crystals sprinkled over quartz crystals. From the Nikolayevskiy Mine. Very attractive. A miniature. 5cm across. 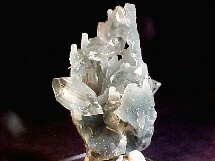 Green uvite crystals on a magnesite crystal matrix. Very fragile. 5 x 5 cm. This is one of my personal favorites! A stunning druzy coated matrix. It simply sparkles all over!